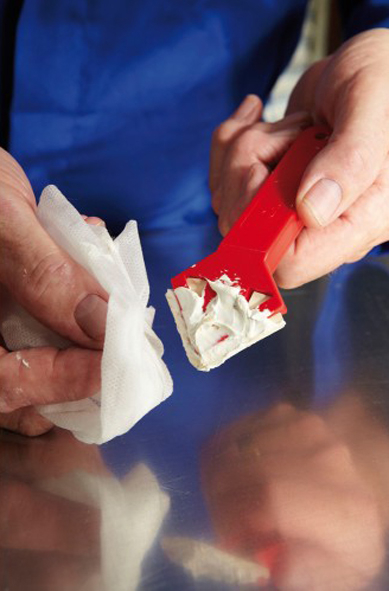 Cleans Up: PAINT, SEALANT, ADHESIVE, BITUMEN, EXPANDING FOAM, OIL, GREASE AND MUCH MORE! EVERBUILD WONDER WIPES are specially formulated for the building and allied trades to clean wet and semi-cured paints, sealants, adhesives, bitumen’s, polyurethanes, expanding foams, polyester fillers and epoxies from hands, tools and surfaces. Everbuild Wonder Wipes contain a powerful Anti-Bacterial Additive that is tested by an independent laboratory to BS EN 1276:2009 which is the standard for killing bacteria. Wonder wipes are active against most common bacteria found in the home and workplace. See independent test reports for full details. WONDER WIPES also easily remove oil, grease, petrol and inks, yet the powerful cleaning agents are still kind to hands. Available in handy 100, 300 and 500 wipe tubs. Removes finger marks, dirt, grime, oil, grease, petrol, inks, food stains, part cured sealant and paint smears. Do not use on porous surfaces such as untreated wood. Pull off lid and open closure. Find start wipe in centre of roll. Pull out approx 1 foot of wipes and thread through lid. Replace lid immediately and reseal closure.